Customize your team soccer uniforms! Shop our selection of ladies soccer jerseys and ladies soccer shorts, handpicked by Shop4teams and delivered to your doorstep! We can help you choose your colors, add your team logo, and answer any questions about the product you may have. We offer you unbeatable prices on team soccer jerseys from top brands like Augusta, Badger, Holloway, Teamworks and High Five. Add your logo and player numbers to a customized soccer jersey for a unique style. Create your own custom soccer jerseys with the help of Shop4teams. Let our team help yours kick it this season! 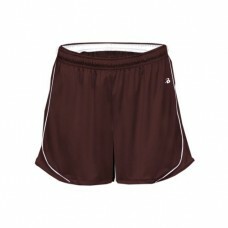 Size chart 92% polyester/8% spandex pinhole mesh * Wicks moisture away from the body * Ladiesin fit .. Size chart 100% polyester moisture management/antimicrobial performance fabric. 5" Inseam. Double-ne.. Size chart 100% Polyester moisture management/antimicrobial fabric. 3" Inseam. 1.5" exposed elastic ..